Nasdaq ETF symbols tracks different parts of the Nasdaq stock market. The Nasdaq stock market is the market known for representing different technology stocks, i.e. mostly companies that are in modern industries like information technology and biotechnology. The Nasdaq 100 index exchange traded fund is the most popular choice from the list of funds for Nasdaq index investing or trading. This Nasdaq fund has symbol QQQ. 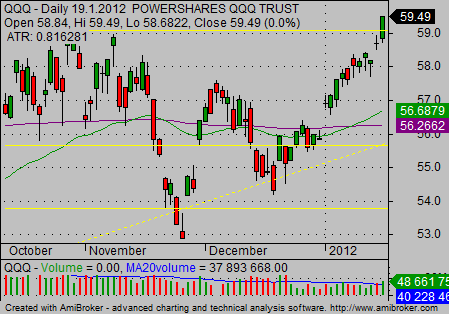 It is PowerShares QQQ exchange traded fund. This is a very popular Nasdaq etf. It is used not only for etf investing but also by short term traders for day trading and short term trading strategies. This exchange traded fund is based on the Nasdaq-100 Index. The index includes 100 of the largest domestic and international non-financial companies listed on the Nasdaq Stock Market based on market capitalization. The portfolio is rebalanced quarterly and reconstituted annually. 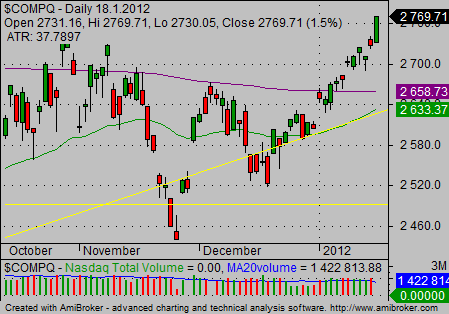 Here is a typical daily Nasdaq 100 stock market index chart. Another option from the list of Nasdaq funds is ONEQ. 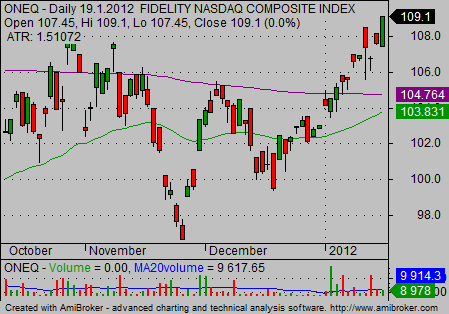 This is Fidelity Nasdaq Composite Index. This exchange traded fund is provided by Fidelity and tracks the Nasdaq Composite Index. This index is much broader than the Nasdaq 100 mentioned above. I personally use Nasdaq index funds for two major trading strategies. The first one is an intra-day trading strategy. I monitor Nasdaq 100 index exchange traded fund together with the S&P index exchange traded fund and Dow Jones ETF. The tickers are QQQ, SPY and DIA. The basic principle of trading these major index etfs in an intra-day trading strategy is a relative strength analysis. This technically based analysis compares relative performance of these three index etfs. It helps to select the best index etf to trade for the current day. 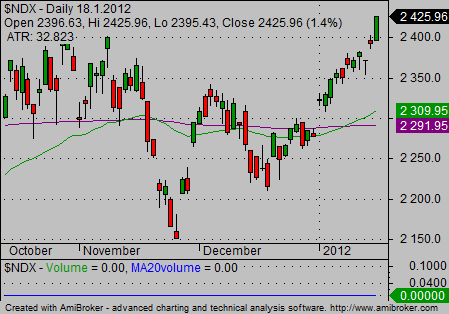 The weakest one is used for short selling when the daily trading mood is bearish. And the strongest one is used when the daily trading mood is bullish.